Käesolevas kirjutises räägivad Estonian Openil osalenud Soome linnumehed Põõsaspea neemel 20.08.2005 nähtud hiireviude liikumisest. Kella 11.30 – 13.15 vahelisel ajal vaadeldi 300-350 hiireviu liikumist mandri ja Osmussaare vahel. Seletust sellisele hilissuvisele hiireviude kogunemisele on raske anda. 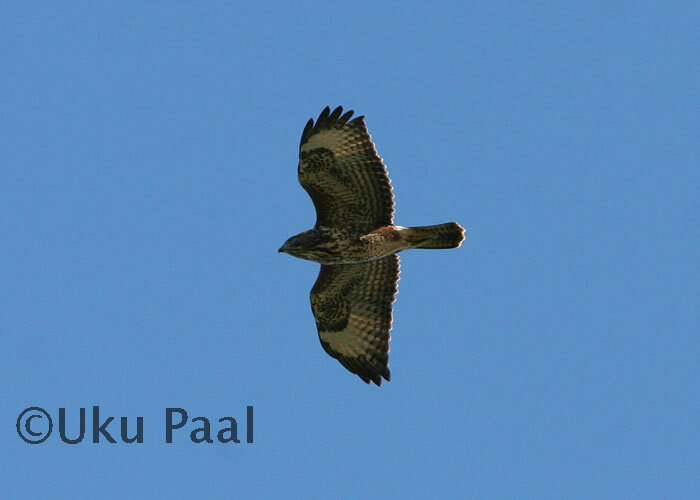 On saturday 20.8.2005, from 11:30 am to 13:15 pm, we noticed 300-350 wandering buzzards (Buteo buteo) at Põõsaspea, Noarootsi. The following text tells about the observation. When we arrived, Mika Bruun, who had with his group been there for a while already, said something like “lots of raptors in the air”. Soon after that I noticed a flock 30 buzzards circling high over “Spitham fields” without any clear direction. Then we noticed some (5-10) buzzards flying over the sea, probably coming from east (Rannaküla) and heading either to Osmussaar or Spitham. At the same time, Mika counted with 60x Swarovski scope at least 65 buzzards circling over the Osmussaar (there were 15 birds before we came). Now, when we realised that buzzards where “on the move”, we concentrated our focus to buzzards flocks in the sky, and quite soon after the 65 birds over Osmussaar, we noticed flocks of 40, 20, 15,10 and 10 over the mainland and still some 15 birds flying over the sea. There were 175 buzzards on the sky! Now, some birds which were circling over our head, seemed to head NW to Osmussaar. The flock of 40 moved slowly to S-SW, as did other small partys over the mainlad. There was, still, some new buzzards over the eastern sea horizon (probably coming from the E/SE) heading slowly to NW (Osmussaar). But now there were also birds (2-5) from Osmussaar, heading SSE! Mika and his group left, and we stayed watching at the sea. After 15 minutes or so, having slowly moving buzzards on the horizon, we noticed again a large flock of buzzards over Spithami; 25 birds. To the left there were two smaller groups, and when watching them, I noticed birds, which were coming from north to south. I realised that birds from Osmussaar were now heading to mainland. But the number was something else than we expected: during the next 20 minutes we counted 140 buzzards coming from Osmussaar to the mainland instead of 65-80. And there was still 30 buzzards left circling over Osmussaar! These 140 birds disappeared quikly to the southern directions. We had seen over 200 buzzards in the last half an hour! It was time for us to continue, but the movement of raptors was over anyway (we did not see any flocks of buzzards in the other parts of Noarootsi later that day). During this almost two-hour session we did see some other raptors too, including five Honey Buzzards (Pernis apivorus), four Marsh Harriers (Circus aeruginosus) and one Hen Harrier (C. cyaneus), but those were (quite clearly) coming from north (i.e. Finland). The total number of buzzards is impossible to say. The minimum is about 300 birds [205 (second part) plus 90-130 birds from the first part, which has already moved to S-SW], maximum beeing 350 birds, or more, if Mika´s birds before we came were different inviduals. The weather was nice and sunny with weak SW wind. As far as I know, there were neither exceptional weather conditions nor strong raptor migration (in Finland) before saturday 20th August (a slight warm “breath” came from SSE to Estonia and Finland on friday). So, what´s the explanation for this? Maybe they were just wandering Estonian Buzzards, which have, for some reason, gathered to these sea-pointing landmarks.